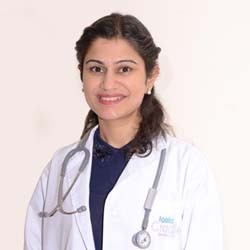 Dr. Latika Uppal is a Paediatrician and neonatologist, practicing in Apollo Cradle, Amritsar. Her Area of interest is in Neonatal development and immunization. She believes in constantly keeping herself abreast with the latest developments in the field of Paediatrics and Neonatology. Dr. Latika and the nurses at Apollo Cradle had offered the best of best services and made us experience early recovery. The housekeeping staff were very supportive and understanding. The rooms were kept neat and clean. Worth to be here. Dr. Latika is a very good human besides being a perfect doctor. She is very dedicated and speaks with her patients in a friendly manner. I and my baby are well treated I will never forget her. Thanks to all the nurses for offering great services. We very highly recommend Apollo Cradle to anyone looking for great healthcare. I was admitted in the gynaecology and obstetrics department in the Apollo Cradle. I had a very pleasant experience under the care of Dr Latika Uppal. She took care of me very efficiently. I was impressed with all of the facilities alike though special mention to the staff members of Apollo Cradle! They were truly professional and accommodating at the same time. My child was admitted to the NICU in the Apollo Cradle. I am thankful to the staff for the excellent care they provided to our child. Dr Latika Uppal handled the critical case very well. Her staff was equally cooperative. Never we have felt a moment of panic because we trusted you. Apollo Cradle has proved to be a lifesaver for our family and we are thankful to them. My child was kept under observation in the Apollo Cradle, Amritsar under the care of Dr Latika. I would like to thank Gurjit for taking care of us like her own family. You are an amazing person and I wish you all the success in life. Ms Komal didn’t guide that well, but thanks to Ms Mandarshan & Amninder for their lovely support.